Getting this knowledge into the hands of the people who need it, however, can be challenging for anyone. Rural parts of Africa often lack both physical infrastructure and computer-based Internet access, making training material delivery and network building difficult. What more and more people do have access to, however, is a mobile phone. 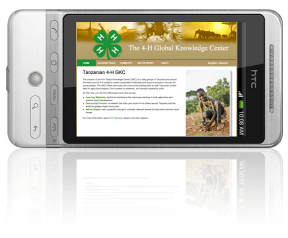 To reach these people, 4-H turned to Monarch Media to build an online Global Knowledge Center specifically tailored for mobile browser access. The result? An mLearning portal pilot project that delivers training and community-building tools to Tanzanian 4-H leaders.